I also picked up 14 3 1/2″ hex head bolts, and 14 washers. I’ve ordered the McMaster Carr fittings per Msr Schwarz, and will probably go ahead and start with basic tnuts to make sure the assembly will work until they arrive. 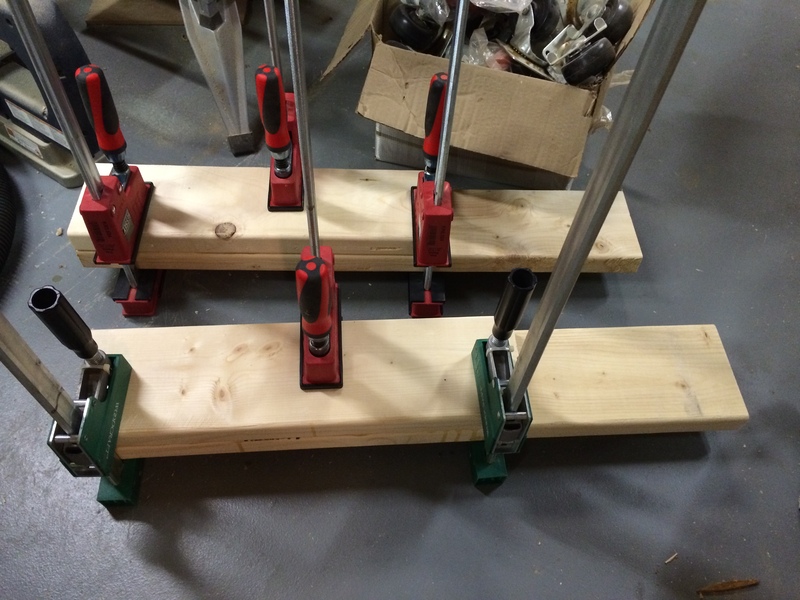 I had the store cut the 2×12’s into 6 foot lengths – and the result is I will have a bench that is 5′ 11″ long. I jointed the 2×12’s and glued up the top, then cut the 2×10 in half jointed and glued it for the under-top. Once that had dried successfully I cleaned up the glue line, then measured and set the undertop to the top, added glue and used 16 screws as clamps to secure them together. 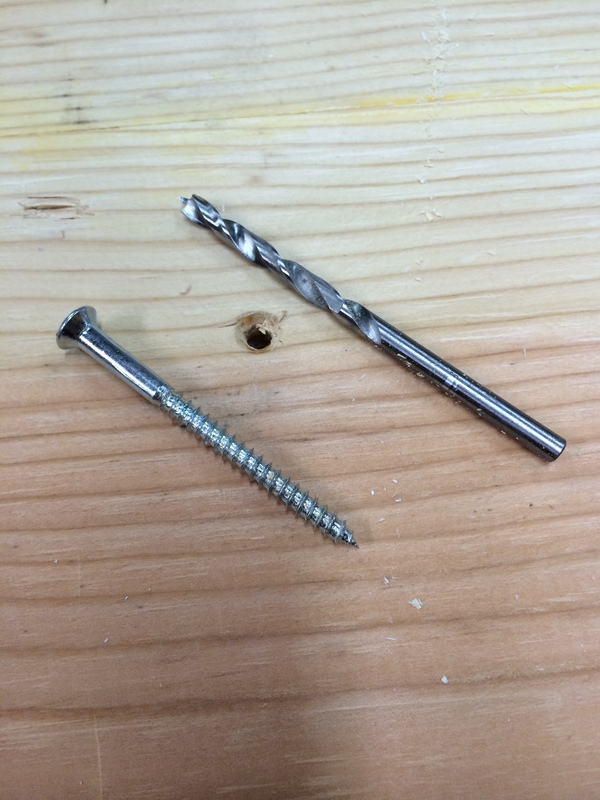 After watching the Naked Woodwork video, I was remined that the holes in the undertop should be the same size as the threads – I want the screw to act as a clamp, so I want the threads biting into the mating piece. It seems to have worked out nicely. Finally I measured and cut the leg parts out. 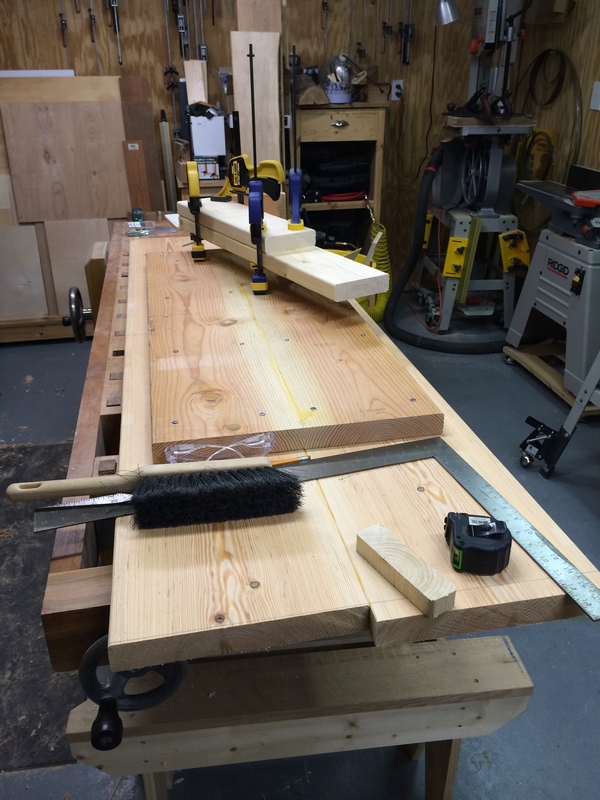 I want the bench to stand about 33″, so I sized the top of the long leg section to 31 1/2″, and the short section was then 11 1/2″ shorter to accomodate the width of the apron. I used just glue and clamps to set those in place. Tonight I plan to remove those screws, and put the aprons together.